This is an issue with es-1.1.0. The same requests execute successfully against es-0.2.4. It is possible to view and validate the data in qgis. there has been a huge geo refactoring going on between those affected versions, will check for a regression there. Do you have any other data where this happens with, or is it just this single polygon? Thanks a lot for all your input! versions, will check for a regression there. which still failed to ingest, after the patch was applied. thanks a lot for all the data, I will test with the other polygons as soon as possible (travelling a bit the next days, but will try to check ASAP). @spinscale wondering if you had a chance to look at this? We are looking to do a major elastic search upgrade, but will not be able to without a fix. Please let me know if there is anything I can do to assist. These polygons fail to ingest when the point in the hole (the first point in the LineString, or the leftmost point in the patched version #5796) has the same x coordinate (starting or ending) as 2 or more line segments of the shell. I have created another gist (https://gist.github.com/marcuswr/e0490b4f6e25b344e779) with simplified polygons which demonstrate this problem (hole_aligned.geojson, hole_aligned_simple.geojson). These will fail on the patched version. Changing the order of the coordinates in the hole so the leftmost coordinate is first and last (repeated), should result in it failing in both patched and non-patched). There are additional polygons shown which touch or cross the dateline (the dateline hole should be removed from these polygons -> convert to multi-polygon). These failures only occur when fixdateline = true. 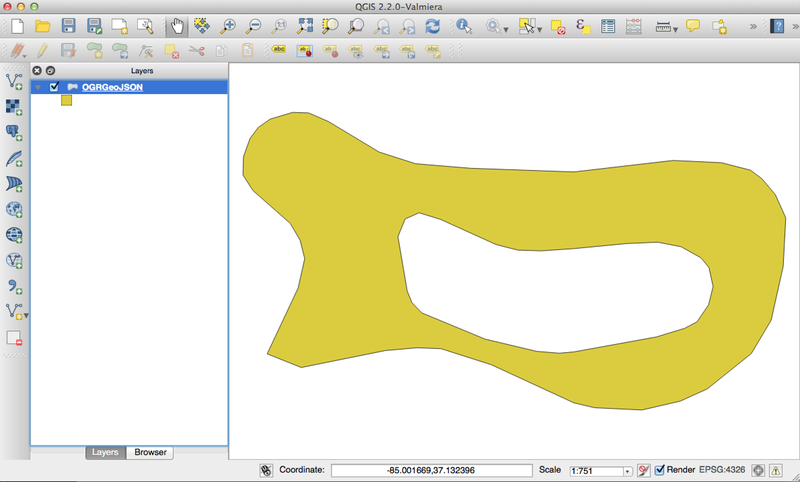 Additionally, could you tell me why there is special handling of the ear in ShapeBuilder.intersections? Also Double.compare is not guaranteed to return -1, 0, 1 I'm not sure what the equality is testing for. Only use dateline fix when polygon crosses dateline. do not span the dateline. Hey @spinscale sorry to bug, but do you think you could glance at this PR and at least indicate if ES would move forward with it? If so, we (I work with Marcus) can proceed locally as the finer details of the PR are worked out. The bug reproduces when the point under test for the placement of the hole of the polygon has an x coordinate which only intersects with the ends of edges in the main polygon. The previous code threw out these cases as not relevant but an intersect at 1.0 of the distance from the start to the end of an edge is just as valid as an intersect at any other point along the edge. The fix corrects this and adds a test.